1. Return Address Stamp Whether it's used to notify everyone of their move or to send out thank you cards for all of their wonderful goodies, a custom stamp always comes in handy! 2. Wooden Door Decoration Help them set the beautiful first impression that their new home deserves. Get them a beautiful wreath, a customized wooden monogram like this one from Peggy's Gifts here in Lexington! 3. House Address NumbersThis gift is another way to help their home stand out from the crowd! How chic is this metal address? 4. Throw Pillow Let's start making your friends' home cozy! This paw print throw pillow would look great on any couch here in Lexington, and you can buy it right here in town also at Peggy's Gifts! 5. 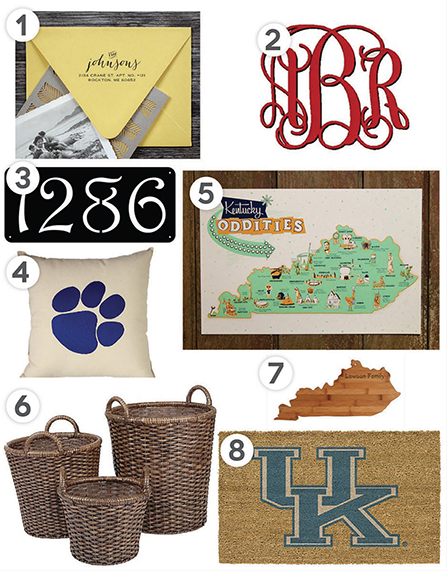 Kentucky Print Help your friends really make their new home their own with some amazing artwork for their walls! This print comes from Kentucky for Kentucky...another local place to get some amazing stuff! 6. Storage Baskets Who couldn't use more storage? As your friends are going through all of their stuff and unpacking, more pretty storage could be exactly what they need! 7. Cutting BoardA gift like this is so unique and special! You can get it customized for your friends, and they can use it for years to come! How cute would this look as a serving tray for a party? 8. Welcome Mat Another first impression stunner. Welcome mats come in such a variety of designs, you can find something special for everyone! How perfect is this one for a lonely front porch here in the Bluegrass?